One thing inevitably follows the next - if the first thing is tolerated. When the Supreme Court, America's unelected legislative body, created an exception (several, actually) to the Fourth Amendment’s clear and definite prohibition of searches without having first established probable cause and without a specific warrant, the Fourth Amendment became a functional nullity - the equivalent of a plastic water jug shot through with holes. One of those exceptions created out of thin air by the Supremes is the one which empowers armed government workers to randomly stop motorists who've given no reason to suspect them of having broken any laws - in order to force them to prove they haven't broken any. This exception to what had been the Fourth - and Fifth - Amendment's protections created Checkpoint America. Which didn't used to exist. Millennials won't remember that better, vanished time, but anyone older than 40 today can remember it. Americans were once free to travel unmolested by the state's armed goons unless the state's armed goons could give a reason for molesting them, specifically. Public saaaaaaaaaaaaaaaaaaaaaaaaaaafety is given as the justification for the trampling of the Fourth and Fifth Amendments' clear prohibitions of this checkpoint business. "Someone" among the herd of randomly stopped cars might be "drunk" - or some other illegal thing, it is argued. One could of course just as easily turn this around and argue that any of the armed government workers performing the random stop/search might have just raped a child. Or perhaps his pockets are stuffed with money stolen from . . . "someone." Perhaps they all should be compelled to disprove the allegation upon demand - for the sake of public saaaaaaaaaaaaaaaaaaaaaaafety? Never mind. Logic being as defunct as the Fourth and Fifth Amendments. In place of the guarantees the people were once promised, written in the plainest, clearest language imaginable - The right of the people to be secure in their persons, houses, papers and effects against unreasonable searches and seizures, shall not be violated, and no Warrants shall issue, but upon probable cause, supported by Oath or affirmation, and particularly describing the place to be searched, and the persons or things to be seized - it is now “lawful” to randomly stop people, without warrant or probable cause, subject them to searches (eyeballing the interior of your car is a search) and require them to prove their innocence of such crimes as having consumed legal alcohol in whatever arbitrarily forbidden quantity or of having partaken of arbitrarily illegal “drugs” in any quantity. Re-read that part about "shall not be violated." No exceptions are listed - except those based on "probable cause" and very particularly describing what is to be searched for and seized - as opposed to a random fishing expedition, as we've all grown accustomed to tolerating. That outrage ordained and accepted, the next and worse will inevitably follow. It already has, in Canada - where the badged and armed ones have been empowered to demand that people prove to their satisfaction they aren't “drunk” or “high” even if they aren’t driving. Even if they are at home. Canadian cops can now bang on people's doors and demand they submit to a breath test "within two hours" of driving - and if alcohol is found in their system at that time, it's an arrestable offense. Even if the drinking occurred after the driving stopped. You drive home, park the car, grab a beer or three and sit down on the sofa to relax after a long day. Unbeknownst to you, "someone" called to report you swerved or cut them off on your way home - but perhaps all you did was pass them or "speed." This enrages some people - who can now do more than flash their brights and honk their horns in impotent fury. An AGW is dispatched to your house, there is a knock on the door. . .
Canadians are subject, in other words, to being SWATTED on the basis of an allegation of a violation of DUI laws . . . hours after they stopped actually driving. Your neighbor - the one you argued about over grass clippings or maybe a barking dog - only has to pick up the phone. 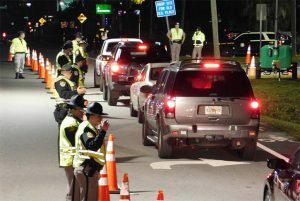 Canadians actually driving are also subject to mandatory breath tests at any time, without any need for "reasonable suspicion" that they may have been drinking. The entire country has become, in effect, a gigantic checkpoint, open 24/7. And refusing to collaborate in one's own prosecution by submitting to a breath test - whether at home or in one's car - is now itself a criminal offense. The "noncompliant" victim is subject to immediate manacling and, upon conviction, can be sent to prison as well as fined thousands of dollars on that basis alone. Even if no trace of alcohol is subsequently discovered in the victim's system. 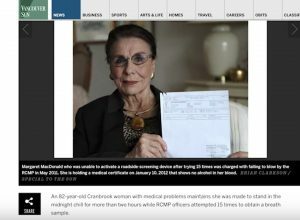 At least one elderly woman with breathing difficulties was cuffed and stuffed - and punished - for not taking the test, in spite of subsequent testing that established she had zero alcohol in her system. And it's not just breath they're testing, either. 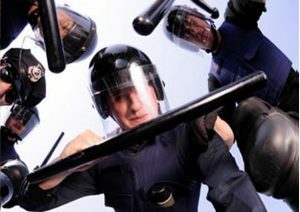 The law (C46) empowers armed government workers to "demand" - the exact word used in the legislation - that drivers ".. provide a sample of a bodily substance for analysis by drug screening equipment "
In other words, the AGW banging on your door in the middle of the night may have a syringe. Imagine being jumped, cuffed and held down while armed government workers (indemnified against any civil liability) extract blood from you . . . in your own living room. And it will be coming here, too. 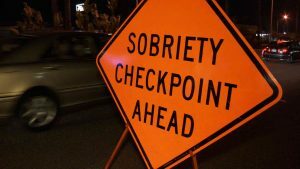 If forcibly stopping motorists at random checkpoints and demanding they prove to the satisfaction of a roadside AGW that they are not "drunk" (as well as other things) isn't a violation of the Fourth and Fifth Amendments, then on what basis would one argue that stopping them anywhere and demanding exactly the same thing is a violation? It will of course be argued that the Canadians haven't got a Bill of Rights - but then, neither do we. The ugly fact is that forced blood draws are already being performed here - with judicial sanction. And it is already effectively a criminal offense to decline to self-incriminate by the side of the road. 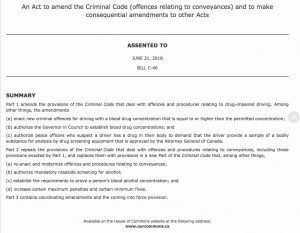 Refusal to take a breath test on demand in this country will result in arrest, suspension of driving privileges (how did it become a state-granted privilege to drive?) as well as the seizure of one's vehicle. All without the necessity of having convicted you of anything. 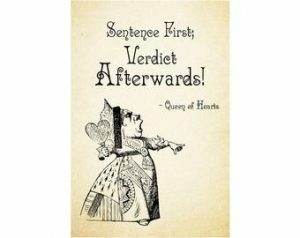 Americans have become used to the idea of sentence first, verdict after - per the Red Queen, from Alice in Wonderland. And it is going to get much worse. Ironically, because of the decriminalization of marijuana - ostensibly a step toward less Hut! Hut! Hutting! that will lead to more - and worse - of it. 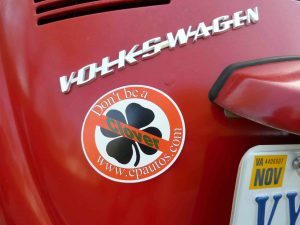 Because THC - the active intoxicant in pot - cannot be detected by Breath tests and can remain in one's blood for days and weeks (and longer) after the intoxicating effect has dissipated. Thus it will be argued that it is necessary for public saaaaaaaaaaaaaaaaaafety to randomly check blood for the presence of THC - and anyone who has smoked pot at any time within the past days/weeks/months will be vulnerable to a Hut! Hut! Hutting! for as long as traces remain in his system. It is equally likely they will soon begin mandatory DNA swabbing as well. Why not? How could anyone object - given established law and precedent? "Someone" might be an on-the-loose felon, for instance. We are without doubt through the looking glass.